This is a "Crochet-along" proyect. You don't have to sign up for this proyect. Every week (for 50 weeks) we're going to post a patern or a link to make a square. At the end of the year, you'll have 50 squares and with them you can make a precious afghan, with all the memories of your online friends! We're going to post 2 level of difficulty squares. 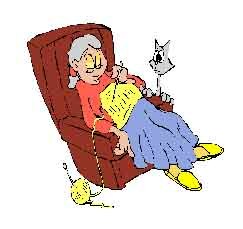 One will be easy for the beginners and another a little bit challenger for the ones who have experience crocheting. You choose the one that you like the most. You don't need to do both squares. Also, if you want you can make extra squares for a pillowghan or to make granny pillows. Is up to you! For your comfort, we have move the Afghan 2001 links to it's own page. The new homepage is divided by month, so you can see 8 links in each page. This way the page download faster and it's more organized. We hope you enjoy this new feature!